Review current and forecasted tuition and fees for Brown Mackie College - Louisville, in addition to just how these costs contrast to nationwide and regional averages. Understanding the tuition related to going to Brown Mackie College - Louisville will enable you to plan economically for 4-6 years. Check out the numbers here to understand how Brown Mackie College - Louisville's price compares to other colleges and universities and if you need to plan for a rise in tuition. The following table shows how Brown Mackie College - Louisville compares to other colleges nationally, regionally and by state. Full-time undergraduates at Brown Mackie College - Louisville were charged $12,492 in tuition and fees in the 2017 - 2018 school year, prior to adjustments for financial aid. $11,592 was the cost of tuition. $900 was the price of fees. For more info, click Brown Mackie College - Louisville Part Time Tuition & Fees. Tuition and fees at Brown Mackie College - Louisville have remained stable in the past 5 years. We predict the price of tuition and fees for this year will be $12,403. If costs remain constant, two years at this school will cost you $24,719 and four years will cost you $49,087. Furthermore, you may have extra expenses such as room and board, transportation, and books. 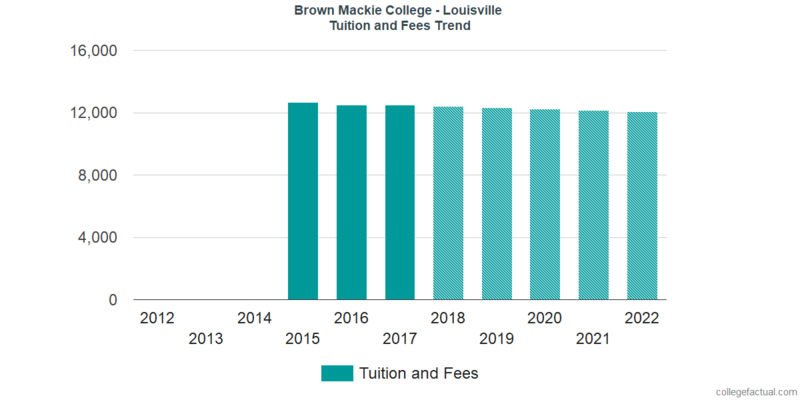 The following chart shows predicted future tuition and fees for undergrads at Brown Mackie College - Louisville. Pay attention to just how much the tuition and fees are increasing yearly. At a lot of colleges undergrads will wind up paying a larger price for their last year of school compared to what they did for their first. Find our answers to frequently asked questions and more information about college tuition and fees.